World Wide Technology (WWT) is a technology solutions provider based in St. Louis, Missouri with locations around the world. Founded in 1990, WWT has grown from a small product reseller to a company of more than 4,000 employees that provide innovative technology and supply chain solutions to large public and private organizations around the globe. In 2017, WWT finished construction on a new 208,000-square-foot building in St. Louis that now serves as the company’s global headquarters. The new facilities were built with a smart office design intended to foster collaboration among local teams as well as interact with remote personnel. As part of this strategy, WWT identified the need for display technologies and after reviewing several competing bids, selected audio visual designer Coltrane Systems to integrate an advanced facility design featuring video display technologies from Leyard and Planar, a Leyard Company. In the building’s new atrium area, Coltrane Systems specified a Planar Mosaic Architectural Video Wall composed of 50 LCD tiles—a dynamic installation to display content in a compelling way. 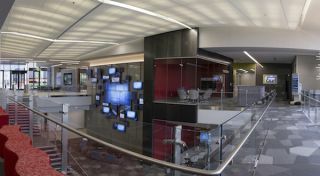 Originally, a steel WWT logo was planned for the atrium wall, but after Coltrane Systems presented the alternative option—a Planar Mosaic video wall—WWT quickly recognized the unique opportunity that the digital architectural canvas offered for creating an impactful and interesting space. According to Mike Dolan, AV manager with Coltrane Systems, the strategy behind presenting the Planar Mosaic video wall was to offer an unconventional approach that would compel WWT to step out of their comfort zone to develop content fitting for the display. “The very shape and contours of the Planar Mosaic video wall, which merge technology and art, work to inspire a more creative type of messaging,” Dolan said. Planar Mosaic video walls—which feature three different sizes of LCD display tiles that can be mounted in any position relative to each other and individually at almost any angle—provide myriad possibilities for creative expression and delivering information in an artistic way. Chad Bockert, vice president of business development and marketing with WWT, said the Planar Mosaic video wall has generated excitement in the atrium space while providing a new way of connecting with customers. “On a weekly basis, we bring in customers and partners to conduct what we call executive briefings, and the Planar Mosaic video wall provides a great medium to highlight the relationship that our companies share,” Bockert said. The dynamic platform of the Planar Mosaic video wall has also led to the development of content that is intended to help reinforce WWT’s corporate culture. “We are using creative messaging to emphasize our core values, our mission statement and our vision, while also highlighting efforts by our employees in giving back to the community,” Bockert said. The new WWT corporate headquarters includes a below-grade, 300-seat auditorium that will be used for executive presentations including the company’s annual corporate update, given by WWT’s CEO, Jim Kavanaugh. At the front of the auditorium space, Coltrane installed a 55-feet-long, 13-feet-high Leyard TWA Series LED video wall with a 1.8mm pixel pitch (TWA1.8), the largest Leyard indoor LED wall ever installed. Architected to provide a crisp, high contrast image using the highest quality black LEDs, the Leyard TWA Series represents an ideal choice for supporting WWT’s interactive corporate updates. Wide viewing angles deliver excellent off-axis uniformity while advanced calibration provides maximum full color and brightness uniformity across even the largest video walls with no visible seams. Originally, the auditorium space was planned for a rear-projection video wall system, but in a similar fashion to what led to the Planar Mosaic video wall installation, Coltrane Systems proposed the alternate Leyard TWA Series LED video wall solution, highlighting the impressive features and operational benefits that LED and the Leyard TWA Series provides. Additionally, on either side of the auditorium wall, a total of six (three on each side) 86-inch Planar UltraResSeries 4K LCD displays are built into the walls, designed to display outdoor video footage when the auditorium is in use to help diminish the subterranean feel of the space. Throughout other areas of the new corporate offices, 98-inch Planar UltraRes Series displays, including one interactive Planar UltraRes Touch display, are deployed for increasing engagement, improving collaboration and creating a more dynamic and interactive work environment. Applications include two Planar UltraRes Series displays in WWT’s executive boardroom, two more in the employees’ network café area and a single Planar UltraRes Touch display located in the building’s new corporate lobby to greet and guide visitors. The Planar UltraRes Series displays in the executive boardroom are used to support high-level presentations and enhance video conferencing through a vivid and immersive experience. “The executive boardroom is where all of WWT’s big decisions are made and we wanted to supply them with the best tools possible, display-wise, to support those efforts,” Dolan said. Every Monday, WWT’s core executive team meets in the boardroom and the high resolution capabilities of the Planar UltraRes Series displays improve the dialogue and connection between executives from locations around the world, according to Bockert. “The extreme clarity of the displays makes it seem as if remote participants are actually in the boardroom,” he said. Featuring Ultra HD resolution (3840 x 2160), the Planar UltraRes Series provides superior performance with exceptional 4K clarity, offering a best-in-class solution for boardrooms, collaborative meeting spaces and high-impact digital signage applications, such as those in WWT’s new headquarter spaces. The Planar UltraRes Touch in the corporate lobby is used as a customer-facing tool to welcome visitors and provide engagement through customer testimonial videos. Combining stunning 4K image clarity with 32 points of multi-touch, Planar UltraRes Touch is ideal for high-level display applications and customer engagement experiences like WWT’s corporate lobby space. The display is also protected against damage by a bonded glass surface called Planar ERO™ (Extended Ruggedness and Optics™) technology, which adds durability while minimizing the effects of glare. “With the Planar UltraRes Touch in our corporate lobby, we are considering weaving in a social media aspect that people can interact with as well as possibly highlighting some of the unique capabilities of our advanced technology center,” Bockert said.